As it turned out, the implementation of the 4V reference voltage in the Soekris DAC has been found to be sub-optimal. 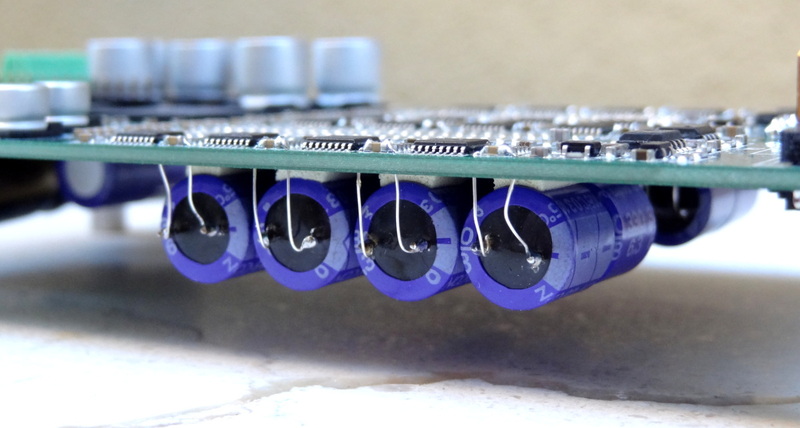 Fortunately, thanks to experiments and measurements by industrious individuals of the audio diy community, Soren, the designer of the DAC, has reviewed the design and has proposed an official “factory” mod which is fairly easy to do. Thus this “mod” seems to be a “must do” in order to achieve the intended designed performance of the DAC, but to many that have been already satisfied with the sonic signature of the DAC, this mod would definitely improve the enjoyment department. 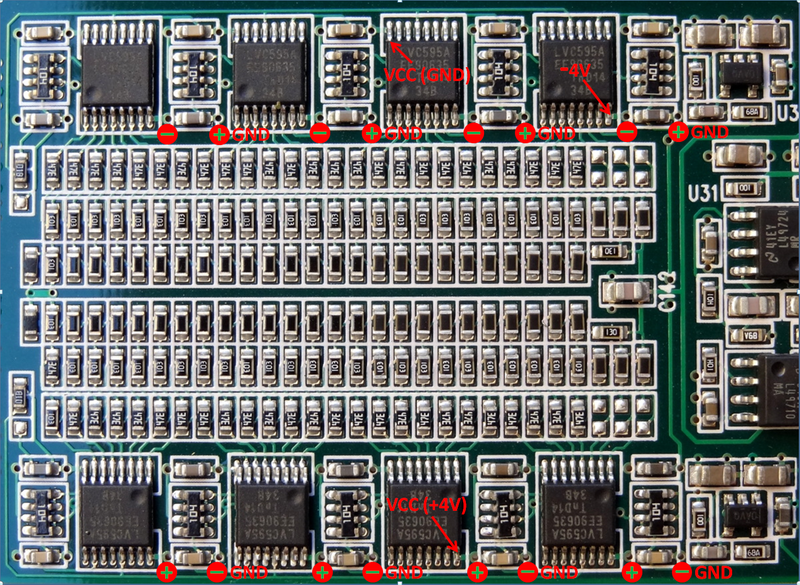 In the Soekris DAC, there are 16 LVC595A shift registers (chip markings indicate that it is an NXP LVC595A [link]). The diagram below depicts the pin description. We are interested in finding out how Vref is related to the shift register. A shift register outputs will be either VLow (0V) or VHigh (VCC) in accordance to the serial data input and clock. Q0 to Q7 are the outputs of the device. 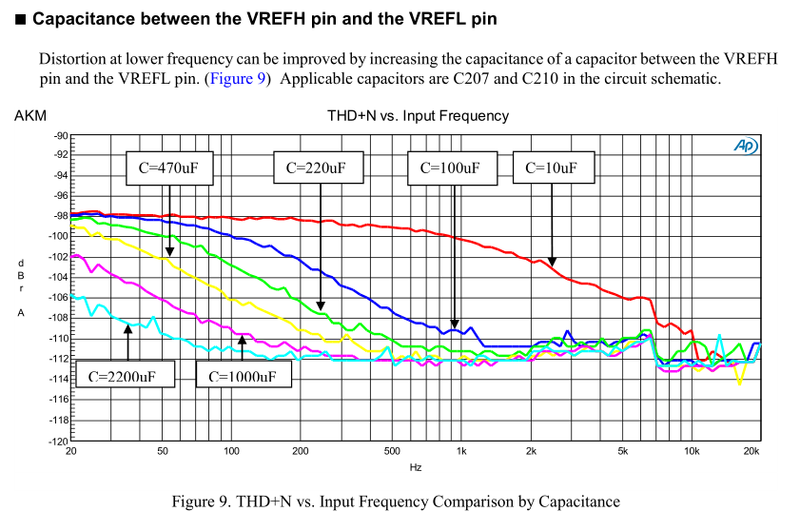 We can therefore see that the reference voltage is the VCC of the shift register. It follows that in the Soekris DAC the quality of the VCC is perhaps the single most important factor affecting the quality of the output signal because this voltage is directly applied to the resistors in the ladder. 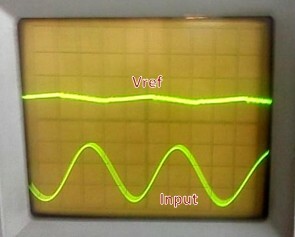 In most DACs, the quality of Vref is directly related to the quality of the output signal. In terms of measurements, this is expressed in the THD numbers. Notice that continuous improvement to the THD performance is obtained with increasing capacitance. Even if using more than 2200 uF. It follows that one can safely assume that increased performance in the Soekris DAC can be had by using large value capacitors to bypass the reference voltage. 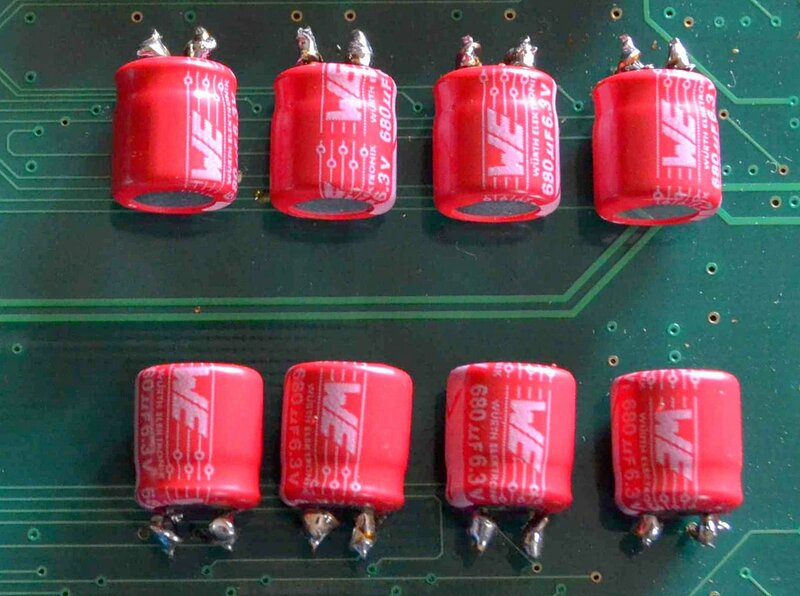 The following traces (borrowed from the diyaudio forum post) show the before and after mod comparison of the reference voltage Vref. The Vref buffer design are unconditional stable with large capacitance, so you can hang on as much as you want, but 220uF to 470 uF low ESR / polymer on each of the four Vref supplies is a good choice. 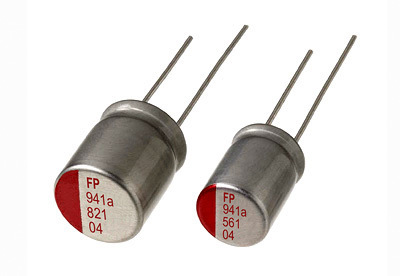 You can also get 47uF X5R 6V3 ceramics in 0805 size, easy to stack on top of existing capacitors…. Please don’t try external Vref supplies, they’re not needed and the risk to ruin your board is great. Because Vref has been designed to be stable with “as much capacitance as you like”, I will implement this mod by adding capacitors at each VCC pin in order to increase the capacitance and also for the fun of it. Notice that for the bottom row, the VCC pin of the shift register is connected to +4Vref, and this is where I will install the larger capacitor. In the upper row, the VCC pin of the shift register is connected to GND. 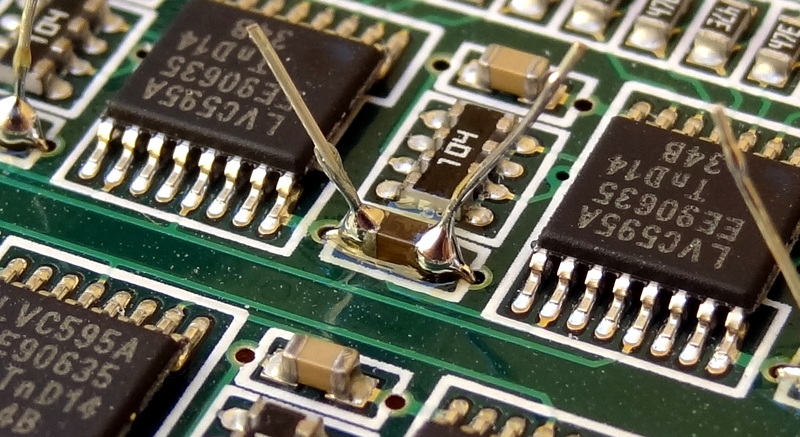 Assuming a solid ground pin, there is no need to install a capacitor here. Instead, the ground pin of the shift register is connected to the -4Vref. Here I will install the larger capacitor. The photo above shows one channel of the board. The other channel is built exactly the same. 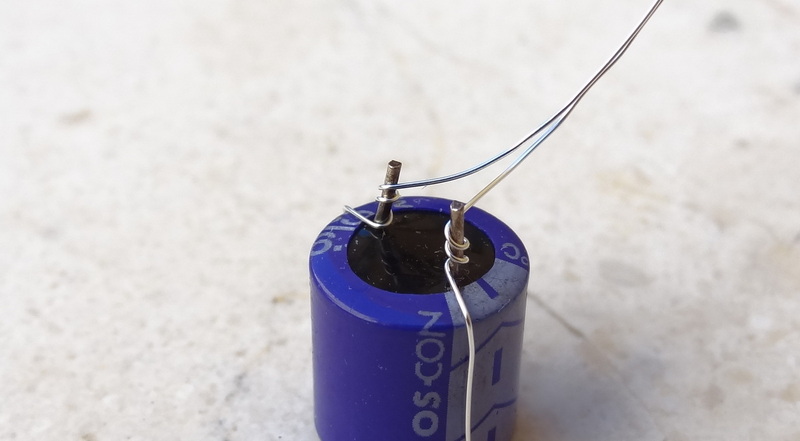 TIP: In the past I had piggybacked electrolytic capacitors on top of the ceramic capacitors and with just a slight bump to the electrolytic, you can inadvertently detach the ceramic capacitor from the board [link] -so you must be extra careful if using this method. The extension wires are thin enough to fit through the power and GND vias. This way I can glue the capacitors to the back side of the board and bring the leads to the front side through the vias. I used some thin insulated wire (after stripping the insulation). I don’t know what gauge but they fit both the small vias (output capacitor of Vref buffer) and large vias (shift register’s VCC capacitor). You can also use the single strands from stranded wiring. I used double stick tape to glue the capacitor to the backside of the board. 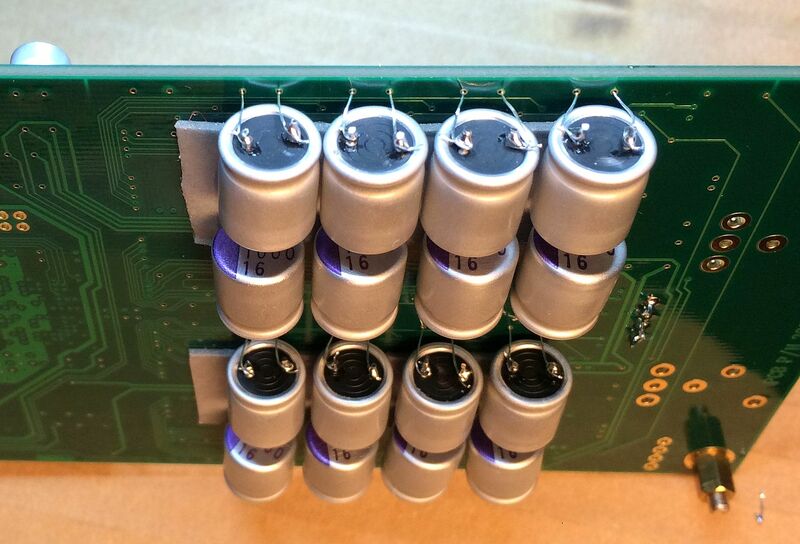 You can also use a hot glue gun to affix the capacitors. 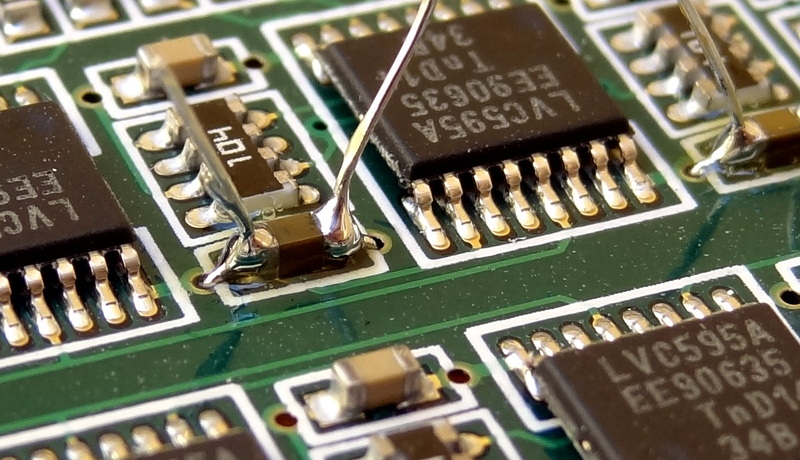 Bending the wires closer and in contact with the ceramic capacitor to facilitate soldering. Actually I measured continuity and the wires already make contact through the vias. 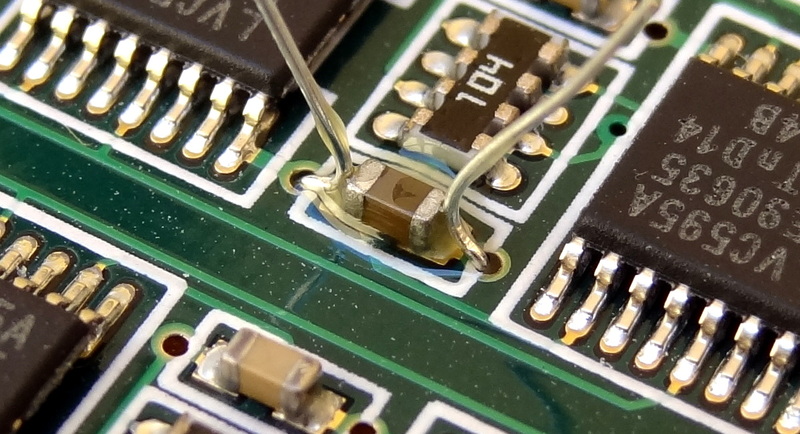 I don’t think it is possible to solder the wires to just the vias, surface tension and solder mask may prevent good flow and contact. To get professional results, I use Isopropyl alcohol (rubbing alcohol) with an old toothbrush to clean up the flux afterwards. Note that this is the “best” we can do with a capacitor mod to “clean up” the reference voltage. Whatever we do to ensure a clean reference voltage is limited to what happens inside the shift register. A shift register is designed and specified to switch between two voltages: a high voltage corresponding to “one” and a low voltage corresponding to “zero”. They are also designed to meet a minimum switching speed, but the outputs are not specified to meet a precise voltage, but rather just a minimum voltage for VHigh and a maximum voltage for VLow. It is amazing that this DAC works so well given the fact that it is implemented with shift registers. 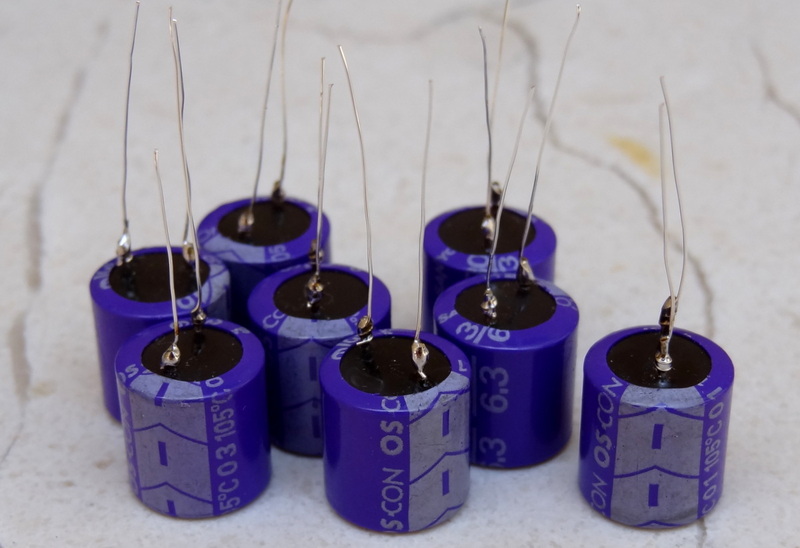 The OSCON capacitors I used are old stuff. The company ended manufacturing of those models in 2011. New technology uses solid conductive polymer (rather than Organic Semiconducting Polymer -where the name OSCON comes from). 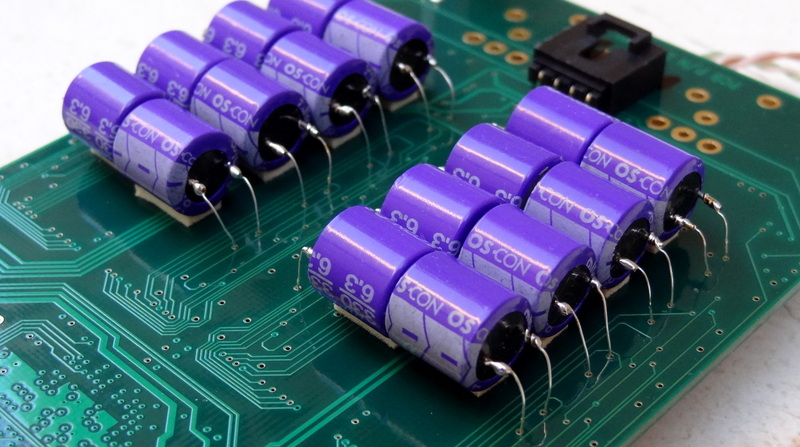 Newer capacitors have even better performance with respect to low ESR and are very inexpensive. For example the following Nichicon FPCAP R7 Solid Polymer [link] at $0.50 in quantity 10 for a 16V 330 uF, ESR=7 mOhm. 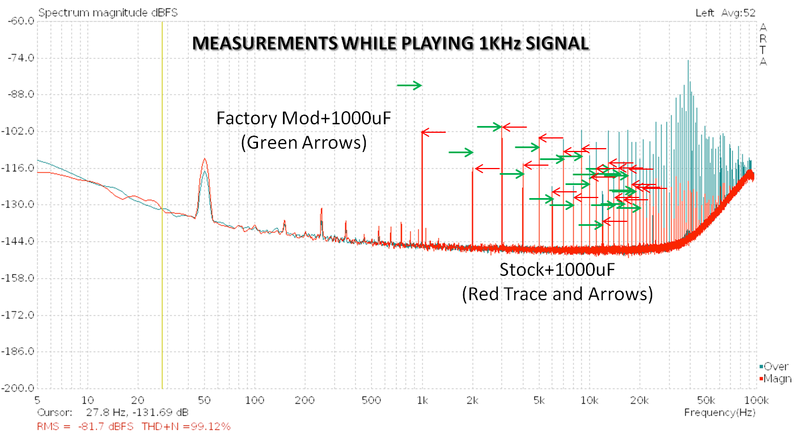 Stock+1000uF has a fairly big noise gain peak around 3.67KHz. With the load oscillating at that frequency the ripple is 3.595mV. If the load is oscillating at 1KHz ripple is 0.169mV. It will basically follow the same trajectory as the Stock+470uF plot with a lower peak frequency. Factory Mod +1000uF the sim’d ripple at 1KHz is 1.006mV, while at 3.67KHz it’s 0.510mV. The worst case with the FactMod+1000uF is 1.226mV at 100Hz, which is about 1/3rd the worst case ripple of stock+1000uF. If you wanted to tweak a bit, try replacing the 0.1R resistor with a 0.01R. There will be a very small amount of peaking above 10KHz but using the 0.01R should cut the ripple quite significantly. 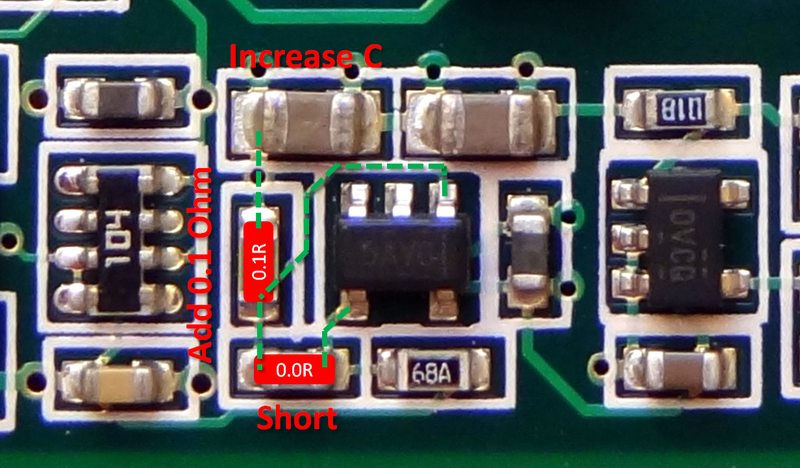 The output capacitor of the buffer, can be paralleled (increased) as much as desired, but a single 47uF X5R 0603 capacitor is sufficient and will fit nicely on the board. The output series resistor needs to be much lower in the order of 0.1 ohm and it is used to eliminate a small peak at the output. This can be done by adding a 0.1 ohm resistor in parallel with the existing 10 ohm resistor. A 0.1 ohm 0603 SMD resistor would fit nicely. The feedback capacitor is to be removed from the feedback loop by shorting it with a wire or with a 0.1 ohm 0603 SMD resistor [link]. 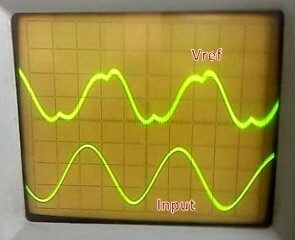 The result in less than 1 mV p-p ripple independent of frequency; with no peaks or changes in voltage precision. It is also what the next production series will look like. Happy about #1. This is the same as the capacitor mod I have done and good thing that increasing the capacitance as much as desired is OK. I didn’t want to remove some of the capacitors I put in as the mod looks real cool :-). Recent measurements [link] have shown that the performance (ripple reduction) of this mod can be further improved by adding more capacitance beyond the the recommended 47uF. Glad to know my implementation of the mod is not just for looks :-). 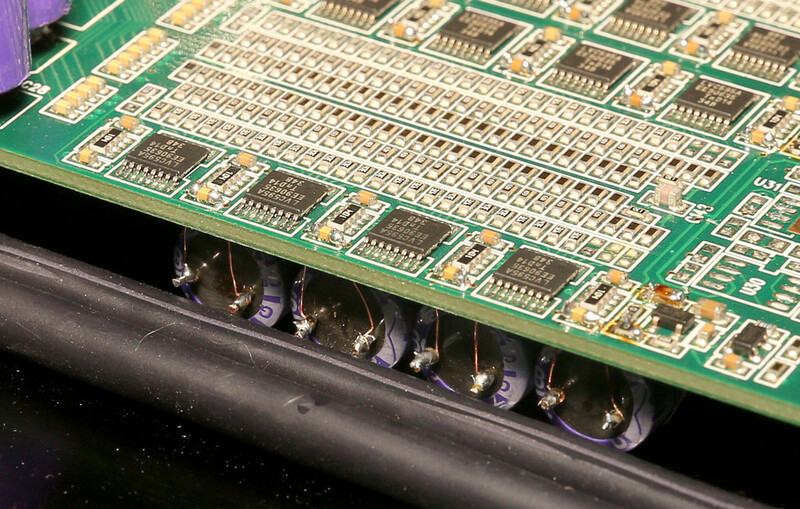 For multiple capacitor installation, this is the best “mechanical” approach. 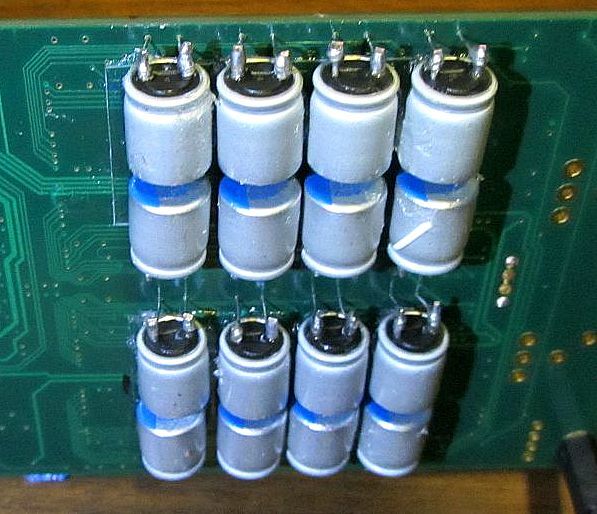 It would be hard to mount multiple capacitors at the location of the buffer output capacitor. For #2, this requires ordering resistors from one of the part shops. Not a common size to find in recycled boards. Got to put a larger order. Not worth paying shipping for a few SMD resistors. Maybe there will be more improvements from the diyaudio community. I’ll wait a little while on this one. Is #1 alone good enough? 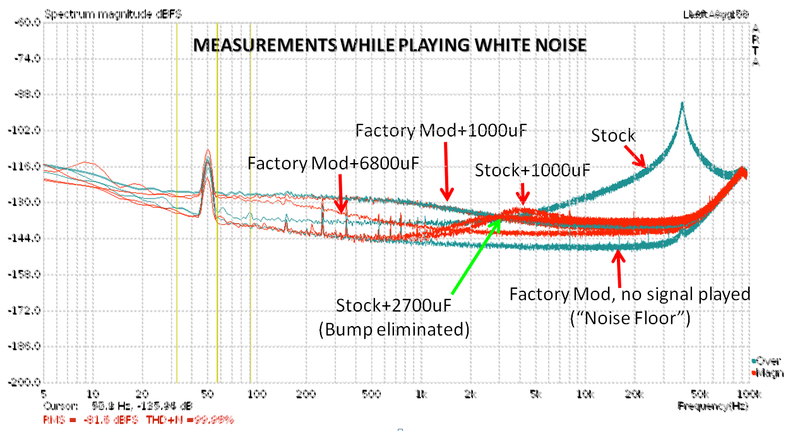 More measurements shared at diyaudio [link] shows the results of different mod iterations. In particular, the stock buffer with 1000 uF of output capacitance compares favorably with the factory mod with 1000 uF. In fact, except for a “bump” at around 4KHz, it has lower noise in frequencies below ~3KHz. Thus the question: is adding 1000 uF to the stock buffer good enough? 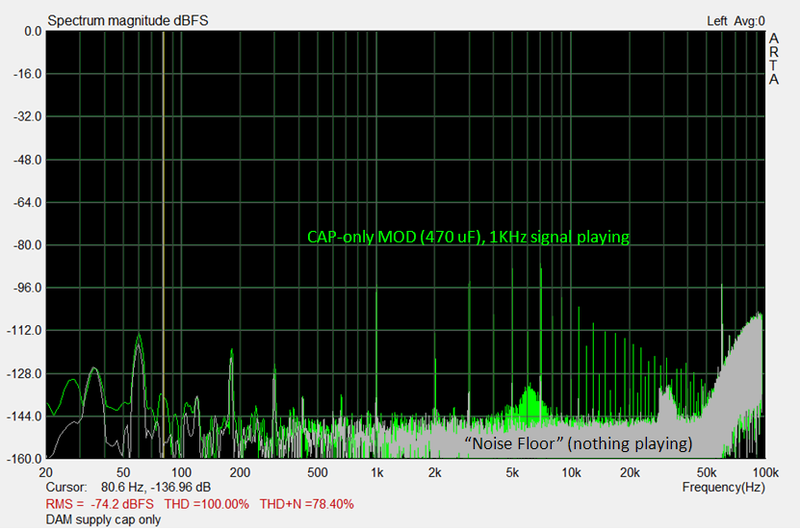 In this graph, the stock+1000uF is ~20 dB lower noise in the 1 KHz component than the factory mod+1000 uF. Only the components beyond the 3rd harmonic (4KHz and beyond) are slightly higher. Another set of measurements show a similar result [link]. I believe this mode refers to this cap configuration [link]. The results are pretty similar to the adding of capacitance to the stock buffer’s output capacitor. Notice the “bump”. Looks like I will leave my mod (which is just adding capacitance to the stock buffer configuration) as-is for the time being. I’ll see what further results can be had from further experimentation. 2- Just add large enough electrolytic capacitors without changing the smt parts, simulations show the best result with 3300 uf low impedance electrolytic on each rail, just your regular good caps, you don’t want their impedance to get too low, 40 mOhm is perfect for the 3300 uF. 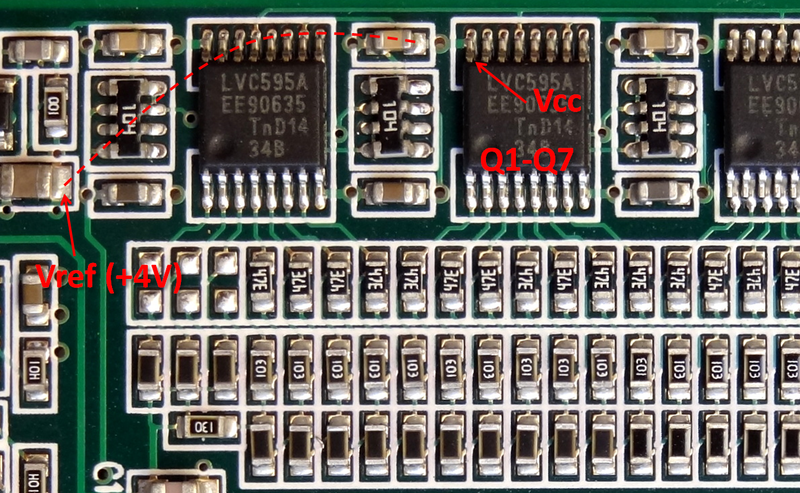 There are an additional internal power supply impedance in each LVC595 shift registers, I have measure 0.3 ohm. 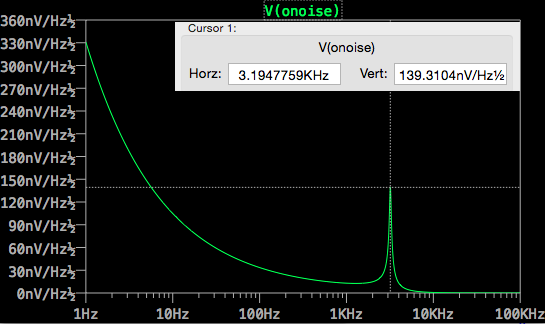 That mean that there is really no reason to get the vref impedance insanely low…. JUST THE BEGINNING FOR VREF? 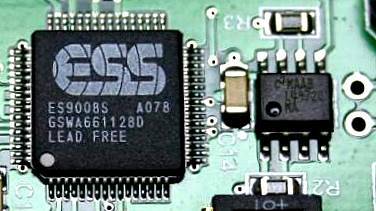 The implementation of the critical analog supply, the AVCC, was as recommended in the ESS application note [link] with DVCC is used as a reference to the regulating opamp. This configuration provided a low impedance supply to the analog pins [link]. 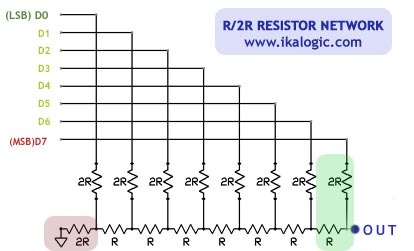 But he main drawback was the pretty nonexistent PSRR (power supply rejection ratio), so the PSRR of the analog supply was pretty much the PSRR of the DVCC that was used as the reference [link]. So maybe there are more improvements to be made. However, there are unique challenges in the Soekris DAC to consider: the Vref needs to be of dual polarity and track each other. Another thing to consider is the question of how accurate the reference needs to be when the resistors cannot be more accurate than 0.01%. Further, there are also inaccuracies to the voltage applied to the resistor ladder introduced by the shift registers. So perhaps the current design is optimal at this point in the sense there are no performance bottlenecks nor performance overkill anywhere in the circuit. Ok, so what’s your impressions? Have you noticed any improvement to what has been proposed by alecm (in case you had replicated those)? I think the most noticeable thing is increased in dynamics as others have reported. In my system it shows up as “more impactful” bass. I can’t say I can hear more detail or better soundstage (if this is what “unsticking the sound from the speakers” means). But I have ribbon speakers and those present a pretty wide soundstage already. From DIY Alecm input, there should be a mod#3. and In his mod#2 and soren recommendation, the additional cap. added on output stage. Yeah, I know. Not keen on removing the balanced output buffers (rather remove the input if at all). Additionally, I plan to use the balanced output for direct connection to Hypex UCD 180 which has balanced inputs. 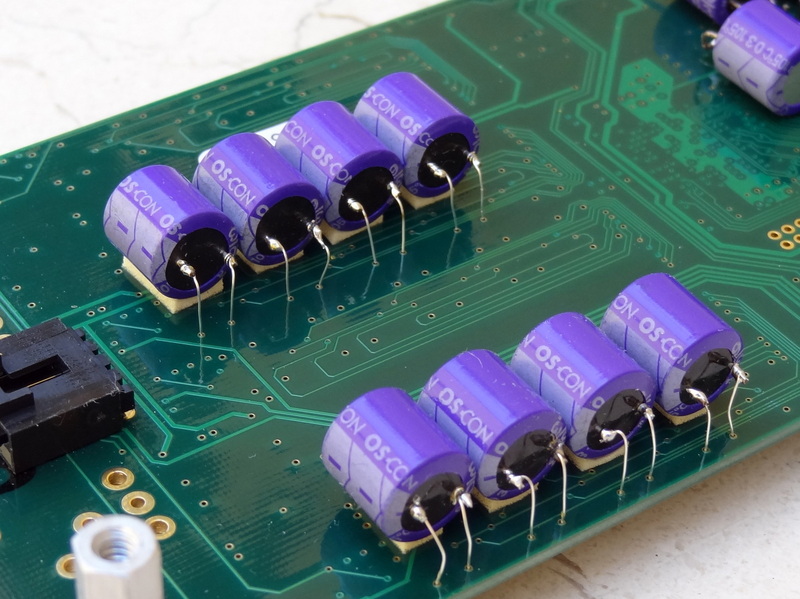 I’m wondering if OSCONs are a good choice as reference voltage caps. Afaik these are not recommended in analog reference voltage applications. Keep the fingers crossed that we see a much better REV2 board of this DAC. I know that there’ll be a REV2. My concern is Sörens kind of “It’s good enough” attitude he exhibited more then once in the early days. I guess he’d never expected such a dramatic space for improvement (if you add up all known mods) with his DAC. Let see how much of the valuable community input he’ll mange to build into REV2. I think lower cost for us and a chance to improve it has higher enjoyment value for us diyers :-). 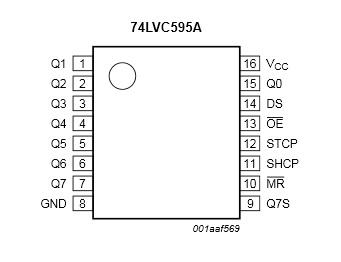 Seriously though, I would like to see how well the shift register outputs track VCC. Have you any details for rev2? No. Only refering to Soren’s comments that he is working on a new circuit for the reference. How are your mods coming along? And thanks fof sharing your work! Now i want to find the better combination of capacitors and trying different nominals and types to show the results later on the forum. My approach based on a transistor using but in different connection. Regarding the results, now I have definitely better noise parameters than Soren’s last proposition… I will show it in details with screens and photos. Cannot thank you enough for this reference place. Your photography is invaluable along with the compilation of good things and, of course, your contributions. Which brings me to my question: I think your approach to the added caps is how I am going to proceed. BUT, I do not have a great selection of smaller gauge wire. In fact, all I have available is that that comes within CAT 5 & 6 cable – both of which are too large. Seems like the easy approach is to get some silver wire since you do not have to worry as much about it being exposed. What gauge wire are you using for the extenders, please? I will have to order and don’t want to guess and get it wrong. Thinking about using SILMICs. Got a bunch of them so might as well. You are welcome. I use some insulated thin wire I got from industrial surplus unmarked and and I don’t know what gauge. But I believe the individual strands of regular copper stranded wires should be thin enough. Just go to the local hardware store and check out the stranded wires. Thanks. I was hoping insulation was not required and reading this I am thinking otherwise. I know nothing about vias and was hoping that I could use bare wire. Yes, no isolation is required. You can use bare wire. The wire I used is white a bit smaller than the diameter of the vias. In fact it fits in the smallest vias (like the via for the output ceramic capacitor of the buffer). Although a thicker wire can be used, I think it could be harder to solder. So a relatively thinner wire that can be easily bent into shape to make some contact with the capacitors would IMO be the best choice. mod #1 to mod#3 any effect for raw out user ? The modification is to improve the vref buffer between the TL431 voltage reference and the shift registers. It was discovered that the reference voltage was varying by around 6mV under load. The added capacitance and alecm and Søren’s modifications are designed to allow the buffer to respond better to the load variations that occur during playback resulting in a more stable reference voltage. This is something that effects the output of the R2R ladder and applies equally to the raw and buffered outputs. The mods result in a massive reduction of “hash” in the output, and appear to lower jitter levels, which is hardly suprising given that varying logic transition points due to supply instability are a major contributor to jitter. The result in my setup is a smoother sound, with better focus and imaging across the sound stage. It really shouldn’t be looked at as a tweak or something that adjusts sound quality to “taste”. The basic modification corrects a significant problem with the rev. 1 DAM1021, and should be consider as a “must do” for all owners. From simulations I’ve done, the stock vref has about 5.8mV ripple under load. Adding 470uF polymer across the output cap of the buffer reduces this to 0.4mV. 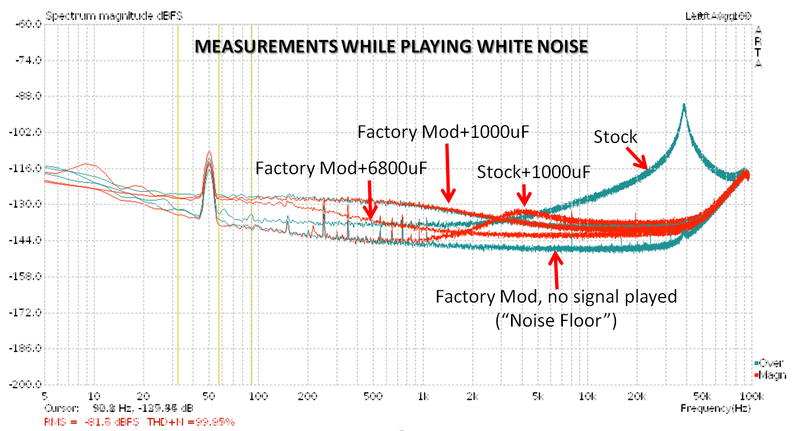 Søren’s “factory” mod reduces ripple to 1.2mV which brings a major improvement over standard, but is not 100%. Adding a further 470uF across the stacked 22uF/47uF caps or Søren’s mod should lower the ripple to 0.27mV. The differing levels of ripple result in clear, measurable differences in jitter and spurious tones in the output of the DAM. Søren’s mod plus additional capacitance is possibly the best of the straight forward mods. Regarding your 16 capacitor mod. I am wondering if there will be any benefit of placing both leads of the capacitor straight to the corresponding shift register VCC/GND pins rather than placing them both on the same ceramic cap? 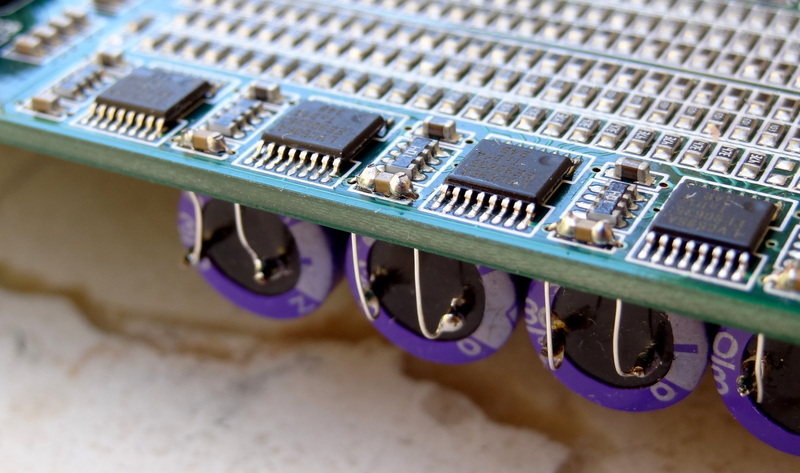 To do this you will have to place the big caps directly under the shift registers and use the lower and upper side via that connects to the ceramics directly adjacent to each VCC/GND pin. I plan on attempting this, if you place your caps on say a 45 degree angle in relation to the via’s near the shift register VCC/GND, it should minimize extra length and allow both leads to be the same length. Will let you know how it goes when my caps arrive. If this was used as a bypass cap (to provide a low impedance path for high frequency noise) then you want to dump that noise away from the chip. I don’t know if there is anything to be gained by connecting directly to the GND pin of the shift register. I think SPIKE is thinking about the best way to handle a feedback loop – always a good idea to make this as short as possible and many have recommended using the pins of op amps as the best place for these to terminate. BigGear’s advice concerning bypass caps makes excellent sense to me with the benefit of making the project infinitely simpler. Thanks for this mod ! It has transformed the DAC from 2D to 3D. Did anyone find out if 28 awg or 30 awg wire was the largest working diameter for going through the vias ? I cannot find a small enough wire that fit. I am using 28 gauge silver wire I got from MICHAEL PERCY. Fits through easily. Wanted to used silver since it will be bare. Thanks for your kind answer. I wasn’t sure that 28awg would fit. A question what the voltage those caps should be? For 16 cap mod or standard mod, Has to be 16V? My board just arrived . I think its rev2 so there should be factory mod . Regarding 16 cap mod I’m little confused . Factory mod says increase capacity at those 4 regs. Where to put the 3300uf low esr caps, any guidance for noobs like me would be greatly helpful…can someone help?? Am having rev 2 board with 0.99 firmware.